Tired of struggling with the plastic packaging on your favorite retail items? When tearing and scissors just won’t work, don’t give up! Get Package Shark™! Package Shark™ opens plastic packaging of all kinds and is completely safe to the touch. Open electronics, toys, batteries and more with the ease of a single swipe of the Package Shark™. The Package Shark™ opens packages of all sorts, no matter what the shape or size: square, round, oblong, big or small. When you have the Package Shark™, you can open them all. 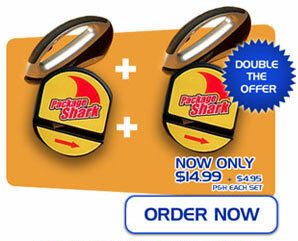 Right now when you order the Package Shark™, you will also receive a bonus pair of Power Scissors absolutely FREE! The Power Scissors cut through fabric with ease, trims photographs and clips coupons neatly, and makes cutting wrapping paper a breeze. Take advantage of this special offer right now and we’ll double your order FREE! Just pay processing & handling on the second set. Two Package Sharks™ and two Power Scissors for one low price!